Part urban think tank, part community center and public gathering space, the BMW Guggenheim Labis a mobile laboratory traveling to cities worldwide. Recently the Lab has announced the publication of 100 Urban Trends: A Glossary of Ideas, which have been drawn from the think tank labs held in Berlin, New York and Mumbai. The resource provides a comprehensive insight of the relationship people have with cities. It allows for a discussion of the current cultural imprints we hope to continue to implement, re-contextualize, and perhaps forget in the years to come. 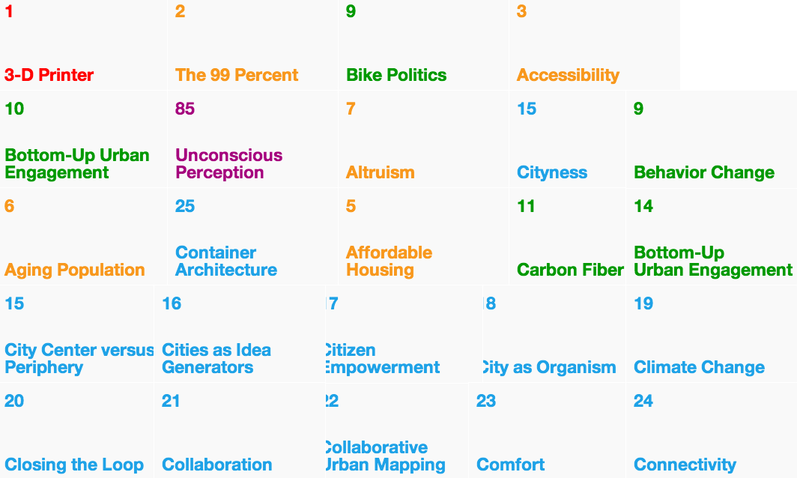 It is possible to vote for whats most important in your city, and you can sort the topics by most viewed. 3-d Printing perhaps unsurprisingly is number 1, just for the impact it will have across society.